On Friday I cooked my version of Chakchouka (or Shakchouka) for dinner.👌 I definitely recommend it if you want a hot tasty paleo dish with proteins but haven’t got any fresh fish or meet available. First of all fry the onions, the garlic and the chillies in a medium size frying pan. Add the cherry tomatoes, the peppers and all the spices. Stir well and cook for few minutes. Add the tomatoes, mixed well and cook for approximately 45 minutes. Add a little bit of water if the sauce becomes too dry. 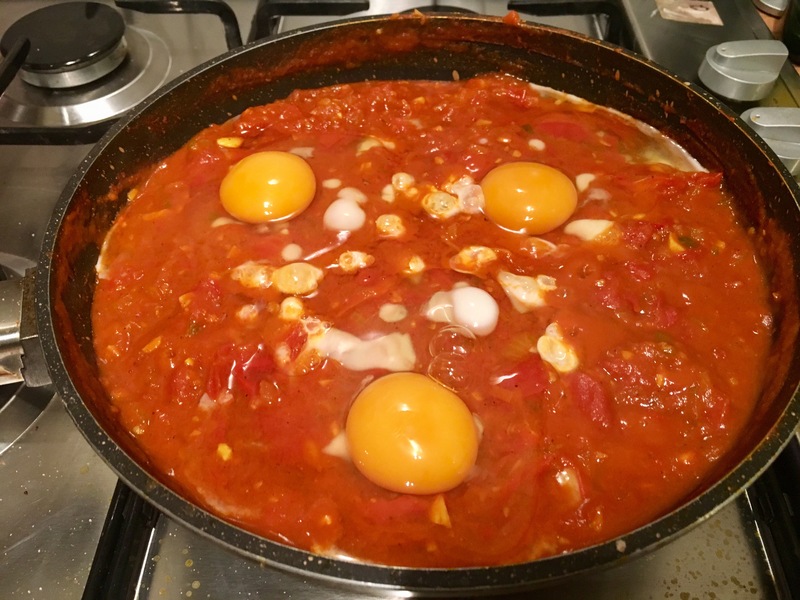 Once the sauce has thicken up and well cooked, break in 2-3 eggs one by one, trying not to break the yolks. Cover with the lid and cook the eggs slowly. Try to keep the yolk soft. Once the eggs are cooked, garnish with the parsley and serve hot.